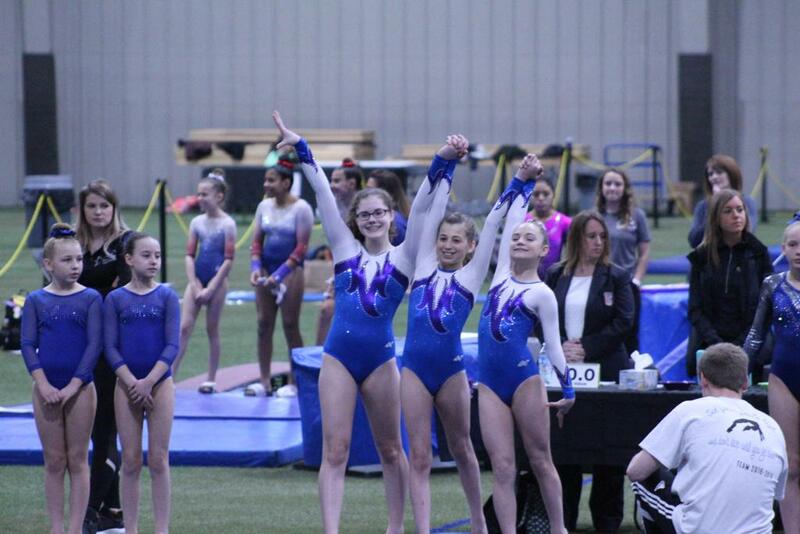 NorthStar Gymnastics Xcel Silver and Gold teams had phenomenal showings at the 2019 State Championships March 29-31 in Pontiac, MI. The Silver team finished 4th out of 57 clubs with a team score of 113.875, while the Gold group placed 6th out of 53 with a 113.800. The group qualified 24 Silver athletes and 17 Gold athletes for the Region 5 Championships May 3-5 in Lexington, KY.
To qualify for Regionals, a Silver gymnast must obtain an All-Around score of 36.000, while Gold gymnasts must achieve an All-Around score of 35.500. Leading the way for the Silvers was Reese DeFrang with a 37.000, good for 26th among the 532 gymnasts who competed all four events over the weekend. Close behind was Alissa Stinson (37.550 AA) in 32nd and Rae DeFrang (37.375) in 60th. On the Gold side, 477 gymnasts competed all four event with Elise Watkins pacing the squad finishing 22nd overall with an All-Around of 37.775. Bella Elliott in 37th (37.600 AA) and Avery Renberg in 74th (37.200 AA).